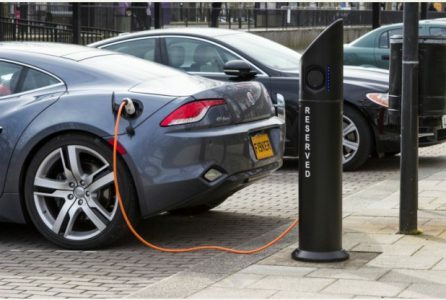 Milton Keynes isn’t just the best place in the world for electric car charging, it also has a remarkably friendly parking policy for electric cars. This allows for free parking with a parking permit, and also at designated charge points without a permit. 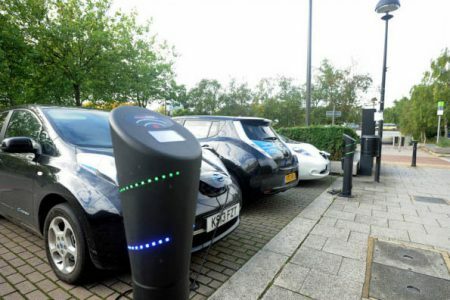 The bulk of parking spaces around Central Milton Keynes are Standard Tariff (so-called ‘purple’) bays – and electric cars can park in these spaces for free with a Green Parking Permit (GPP). There are an impressive 15,000 of these parking spaces in CMK. 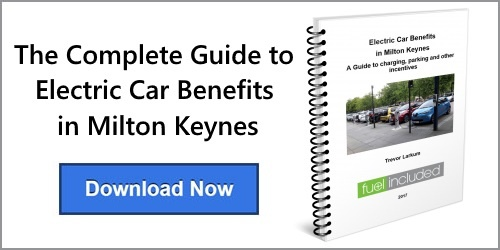 Applications for the GPP are made through the Milton Keynes Council website. Purple bays are arranged around the outside of most of the Milton Keynes blocks, with the exception of the main shopping centre blocks which are Premium Tariff (‘red’). In addition, the GPP allows for free parking in Off Street Standard Tariff Car Parks (there is one of these off Avebury Boulevard) and in Premium Tariff and Peak Permit Parking (‘black/red stripes’). These latter are typically at the ends of blocks close to the shopping areas. The Council provides a handy Milton Keynes Parking Map (PDF) with a colour key which indicates the different tariff locations. All rapid chargers (currently available for 2 hours only) and electric vehicle spaces with ‘Electric Vehicle Charging Only‘ marked on the signage, can only be used by electric vehicles that are plugged in and charging. Electric vehicle motorists do not need to pay to park if parking in these spaces whilst they are plugged in and charging. We also operate dual restriction bays which are reserved for electric vehicles only during 7am – 10am and 4pm – 6pm. During the core hours of 10am – 4pm any vehicle can use the spaces, subject to the surrounding parking restriction. Electric vehicles do not have to pay to park in these bays. A simpler way to understand this, as it was explained to me by a council official, is that there are no restrictions on an electric vehicle parking in a charge point bay for free, except that if the charge point has “RESERVED” painted down its side then the EV must be plugged in. Milton Keynes is a major commuter town with many people driving to MK Station to take the train to London. The parking at the station is not included in the Council scheme. However, it also provides free parking for electric cars under a scheme provided by London Midland, the operators of the rail line (this scheme also covers other stations along the line). I have detailed this scheme previously: Free Electric Car Parking at Milton Keynes Station.